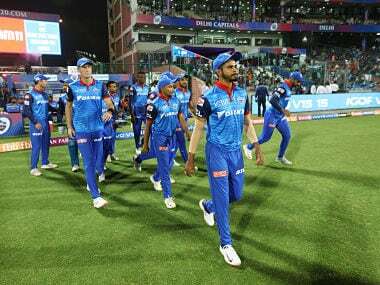 Result: Rajasthan Royals beat Delhi Daredevils by 62 runs. Toss: Delhi Daredevils won the toss and chose to bowl first. 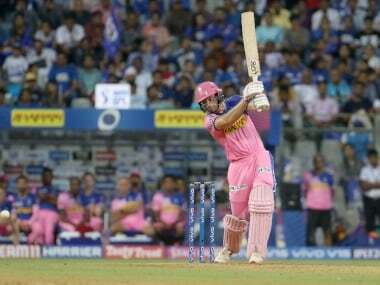 RR 201-6 in 20 overs: Ajinkya Rahane once again anchored the innings to perfection while Sanju Samson played another flamboyant knock as Rajasthan Royals piled up their season-highest total. Rahane scored a stylish 64 off 50 balls while Samson smashed his way to 40 off only 25 deliveries. The duo punished the opposition scoring as many as 74 runs in 6.3 overs for the third wicket partnership. While Rahane mostly played orthodox cricketing shots hitting eight boundaries and a six in the process, Samson indulged in some adventurous stroke-play, hitting two fours and three sixes. Kevon Cooper's 16-ball-32 and James Faulkner's 23 off seven deliveries were also vital. Rahane's 50 came off 45 balls and his only six came when a desperate Shahbaz Nadeem tried to employ a negative leg-stump line only to give him a juicy full-toss. When he was finally bowled trying to hit Nadeem inside out, he had set the pace of the Royals innings. For Daredevils, Imran Tahir (2/25) stood tall amidst some of the others while Rahul Shukla leaking as many as 44 in four overs. In-form Karun Nair (19) started positively as he lofted Siddharth Kaul over extra cover for a six and boundary but was LBW in the last over of Powerplay when he was done in by a Nadeem delivery that dipped in and straightened. Cooper played a short but exciting innings that lasted only 16 balls but yielded 32 runs including three huge sixes and a couple of boundaries before he was holed at the deep extra cover boundary trying to hit Duminy for a second six. The 100 came in the 12th over bowled by Manoj Tiwary. Samson started his innings with a straight six hit into the sight-screen of occasional leg-breaks bowled by Tiwary. Rahul Shukla also didn't improve from his erratic bowling against the RCB where Yuvraj Singh pounced on him. He did not show any inclination in using the change-ups and the batsmen used his pace to get boundaries off him repeatedly. Delhi 139-9 in 20 overs: One one hand you see Kings XI chase down 200-plus totals with ease but bottom of the table Delhi showed no conviction as they set out to chase down a daunting total. Having nothing to lose, one might think they would play some sensible cricket, give Rajasthan a game and inject some confidence in their side — but it was not to be. Mayank Agarwal (17 off 10) smashed three fours before succumbing to Faulkner — sending a dolly to Smith at mid-off. Dinesh Karthik quickly followed in the fifth over — the Rs 12 crore man caught at fine-leg for just three runs of eight balls. 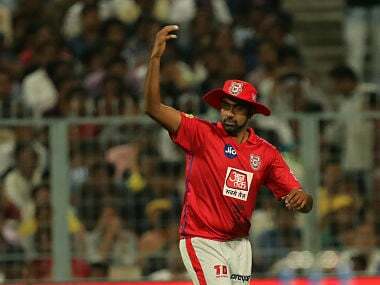 Even JP Duminy, who has been one of the better performers for Delhi this season , couldn't last for more than eight deliveries as Pravin Tambe struck in the seventh over to dismiss him. At this point Delhi were 43-3 in 6.5 overs and in need of a miracle. But no miracle came. Rajat Bhatia sent in a slower delivery to confound Kevin Pietersen (13 off 18) — the big batsman getting an inside edge which went on to hit the woodwork. Delhi were disintegrating and Rajasthan's bowlers didn't give them any breathing space. Ross Taylor (4) was caught and bowled by Bhatia before Kedar Jadhav was run-out in lazy fashion. 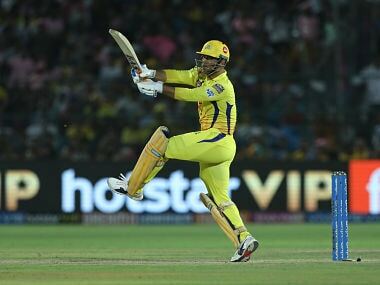 He had enough time to ground the bat and go past the crease but seemed to take the throw for granted — getting caught mid-air with his bat hanging behind the crease as Cutting got his direct hit. Cutting then removed Nadeem (1) from the equation before Stuart Binny grabbed Imran Tahir's (4) wicket. Even Cooper got a wicket — dismissing Shukla in the 19th over which meant every Rajasthan bowler had something to celebrate. 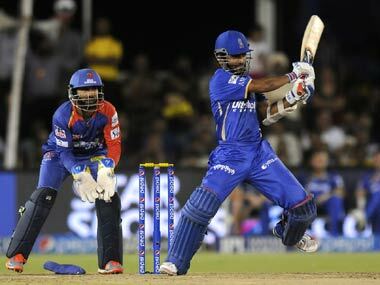 Man of the match: Rahane — once he gets set he is an exceptional player to watch. Seems he's really got the hang of this format.